Conveniently located in the heart of Fayetteville’s Dickson Street Entertainment District, we have a wide variety of all your favorites. Check out our huge selection of liquor, wine, beer and tobacco. We’ve have regular tasting events, and we’ve got fresh craft beer on tap at our Growler Station Express. We’ve got hundreds of beers to choose from, ranging from domestics to imports to great local beers made right up the road. We’ve got the largest selection of local craft beer in the area. We have an extensive selection of wine, from popular priced favorites to hard to find high end wines. We also have the largest selection of chilled wine and champagne in the state, with over 200 wines available chilled. Our Growler Station Express uses the Pegas CrafTap System which retains the same environment from keg to growler, resulting in a fresh, better tasting growler that will last 30-45 days. Check out our Growler Station Menu. Dickson Street Liquor, a mainstay in Fayetteville’s Dickson Street Entertainment District has always had a comfortable family feel. Generations of locals and University of Arkansas Students have frequented DSL over the past 50 years. Patrons and employees fondly remember Bernice and Clarance from the 60’s through the 90’s. Bernice along with Georges Majestic Lounge’s Ms.Mary, Maxine from the Tap Room and the Collier family from Collier Drug were the main threads of the fabric that first made Dickson Street unique and special. 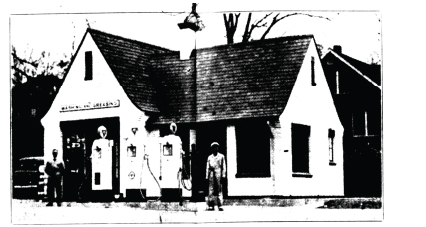 The iconic building that has housed Dickson Street Liquor store since 1964 is one of the most recognizable structures in downtown Fayetteville. 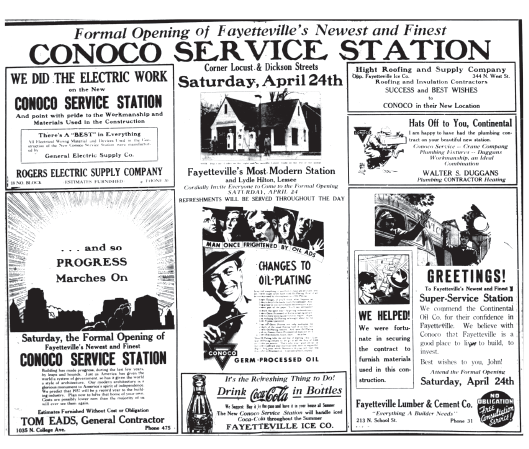 It originally opened in 1936 as Fayetteville’s ‘Newest and Finest Conoco Service Station’. Our entryway was once the location of the service garage door and the vaulted ceilings just inside allowed room for the car lift to operate. While there have been many expansions and additions over the years, the original building’s recognizable profile and structural integrity remains unchanged. Much has changed over the years, but one thing has not: the friendly and funky ambiance found here. The spirit of Dickson Street is alive and well at Dickson Street Liquor! In 1968 the famed group, The Band released ‘The Weight’, a song whose lyrics were penned by world famous local musician Levon Helm. “ Crazy Chester followed me and caught me in the fog ....”references a colorful Fayetteville local who patrolled Dickson Street to ‘keep the peace’. Legend has it that Chester, armed with his two cap gun pistols would always check on Dickson Street Liquor and secure ‘provisions’ while on his regular Dickson Street ‘patrols’. Locals, students, and visitors from near and far will always feel right at home here at Dickson Street Liquor. Don’t make a trip to Dickson Street without stopping by DSL to soak up some funky local flavor. Planning a party? Heading to tailgate? Searching for a great local beer or a bottle of wine? Whatever your needs, we’ve got your covered! Know when to say when and always drink responsibly.